Need a mower that is still durable in the toughest conditions you can throw at it? 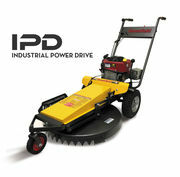 The the Greenfield industrial power drive self propelled slasher is the perfect mower for you. This machine is extremely tough and can still provide a clean commercial grade cut. Whilst having the potential to slash your overgrown areas. The self-propelled drive system makes this mower a dream to operate. Hills and rough terrain is no challenge as the the drive system will pull the mower along itself with the operator only having to worry about the direction it is going in. The 28" turbo-chute collects plenty of grass at once saving you time and money as it covers more area than your conventional walk behind push mowers. This huge deck is complimented by the powerful 11.5 Hp Intek Briggs and Stratton engine, providing more than enough grunt to get the job done. This machine is labelled as one of the strongest on the market for no reason. The fully welded tubular steel chassis, impact resistant alloy blade cover, heavy duty swing back blades and heavy duty spindle made from high tensile 4mm steel are all reasons why this mower is as strong as an ox. So if you'd like one come in and see us today! The generous 28" cutting deck allows for you to cover more area in a smaller amount of time. This is where the strength begins with Greenfields IPD Self-propelled mower. The foundation this machine is built around is rock solid with a low centre of gravity insuring thats its perfect for uneven terrain. Nothing shouts "Aussie Made" more than a set of swing back blades. Australian conditions are unpredictable and rough which is why swing back blades are essential for every mower working in tough conditions. It protects the life of the machine and best of all they are super cheap to replace in comparison with the American bar blade setup. The front of the Greenfield slasher is open which is the reason why they cut Australia grass so well. American made machines by law have to have the deck fully enclosed. Meaning some types of Australian grass like onion grass gets pushed flat then pops back up again once you run over it, getting missed in the cut. With the Greenfield mowers theres no such issue!